Thank you for checking in on me and my family. ALL !! THATS RIGHT!! ALL FOOD AND DRINK WILL BE PROVIDED AT THE BATY BASH! JUST GET THE FAMILY IN THE CAR AND WITH OLD CLOTHES ON, SO EVERYONE CAN RUN. EXPLORE, WALK BY THE LAKE , FISH A LITLLE AND JUST HAVE FUN! NO NEED TO MESS WITH PACKING FOOD AND ALL OF THAT STUFF. ALLYOU HAVE TO WORRY ABOUT IS THAT YOU ARE SIGNED UP WITH THE JUST WHO IS GOING TO BE WITH YOU!! ALSO IF YOU LIKE TO FISH GREAT FISHING IN THE LAKE SO BRING POLES! BOATS,CANOES,KAYAKS IF YOU HAVE ANY!! EVERYONE PLEASE BE SAFE DRIVING!!! Since the money does not go to current patients or the creation of future treatments(no drugs/procedures), I don’t have my heart behind asking everyone to donate. Basically everyone out on that walk doesn’t get any benefits of the money you donate. So we will have a team and some will participate in the walk/run, but we won’t be asking for your money. If you still feel obligated to donate, feel free. The Baty Bash will be an old fashion picnic for everyone!!!! We will have it at a park 5-10 miles away from where the Walk/Run takes place. Games!! Prizes! Fun!!! Pat Groeper has been one of those angels that God has placed in my life during this fight and she as offered to take care of all the planning. We will follow with more details in the very near future. Sunday May 16th is the day. Health wise: I have been feeling very good. I have had a couple days where have felt exhausted. One of those days was last Sunday where I basically stayed in bed from 2 p.m. in the afternoon until 5 the next morning. I talked to the hospital and they said I may have a couple “crashes” like that. They attribute it to the radiation treatment and not getting enough rest. Basically if I don’t rest enough myself, my body decides to shut me down. I do blood work once a week because a couple numbers have been off. Also I now have some high blood pressure numbers so they are monitoring that as well. My last reading was 123 over 88, down from 135 over 95 last week. Big Picture Health Wise: The plan continues to be wait and see. We won’t see anything until we do scans probably in late May or early June. If the to tumors have shrunk enough, then we move on to Liver Surgery #2. After that then the plan is for more chemo. -yuck! I thank God every day that I am not on chemo. Family wise: All is good. Karen continues to fight through her asthma/allergies/cold. Karen and Jaxson continue to improve and move up levels in Tae Kwon Do-they are yellow belts now. 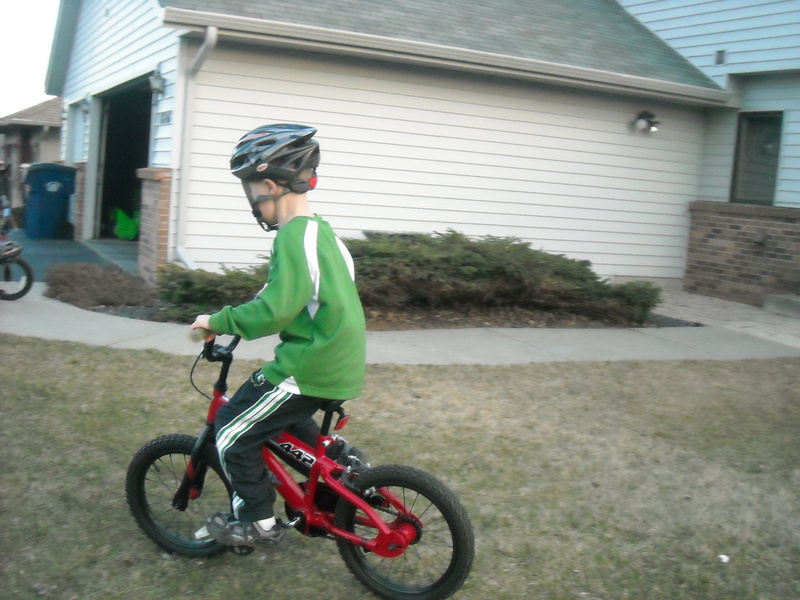 Below is Brenden on one of his first rides without his training wheels. He suddenly got very determined and focused on not having any training wheels on this year. So we worked on it a little bit and he made a couple small runs. I told Jaxson to get his camera and he snapped this photo on one of his “long runs” on day 2 of our training. I think I was a thrilled as he was. One of those big moments in a kid’s life. I love that Jaxson caught it on “film”. Be blessed and have a Happy Easter. More team details and picnic information to come. Thank you for all your prayers, thoughts, cards and gifts. They continue to be a blessing to my health and our family.